Every year we do something at work to celebrate DNA Day. DNA Day is April 25, the anniversary of the publication of the double helix structure by Watson and Crick back in 1953. 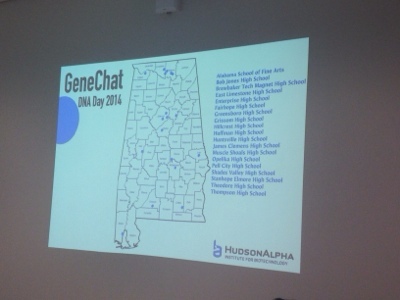 This year HudsonAlpha Educational Outreach hosted an event we called GeneChat. 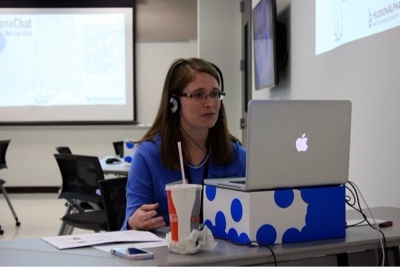 Throughout the day employees of HudsonAlpha sat down at a computer station and chatted with classrooms of high school students elsewhere in the state of Alabama, through the wonders of google hangout. We had teachers and classes participate from all over, from huntsville to mobile and everywhere in between. It was really neat to see the multiple interactions happening simultaneously in the room. And there's me, in deep conversation about genetic counseling with a class at Bob Jones this afternoon. Hope you had a great DNA Day!